Regional Positions Available for "Driver-preneurs"
If you're a driver with the American entrepreneurial spirit, we want you on-board. 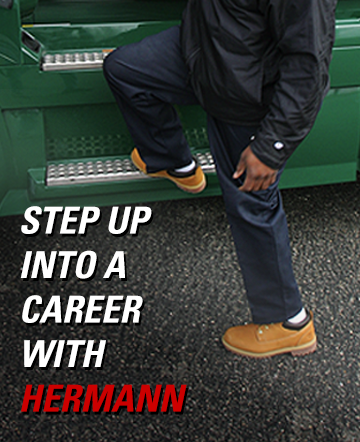 At Hermann Services, we are now offering contracting opportunities for owner operator truck drivers through our Transportation and Leasing divisions. Hermann's owner operators enjoy the backing of a financially stabile company with an 85-year track record of excellent relationships with drivers. We give you the ability and support that you need to run your own business as an independent contractor and/or lease-purchase driver. Hermann Services has always maintained an outstanding safety record. We are currently on zero alert status with CSA and well-established as one of the most reputable carriers in the nation. We accomplish this in part through ongoing safety training and workshops in addition to our annual safety meeting that helps drivers stay safe and prevent accidents. Hermann Services, Inc. is Affirmative Action, Equal Opportunity Employer and committed to providing equal opportunity to all employees and applicants for employment without regard to race, color, religion, ethnicity, national origin, age, disability, gender (including pregnancy, childbirth or other related medical conditions), genetic information, sexual orientation, veteran or marital status, or any other characteristic protected by law. No material contained within this website may be construed as an offer of employment or a binding contract of employment for a specific time period. Either the employee or the employer can terminate employment at any time, for any reason, with or without notice.